This month, Passing of the Pioneers enters its sixth year and the great pioneering stories keep coming. While not intentional, the theme for the month is construction with several of the pioneers having worked as carpenters and masons. Two of those were born a year apart at Taunton, Somerset, England and both started family businesses still in operation today. As you read through, you can click on the names of the pioneer to read their newspaper obituary or other underlined words for further information. 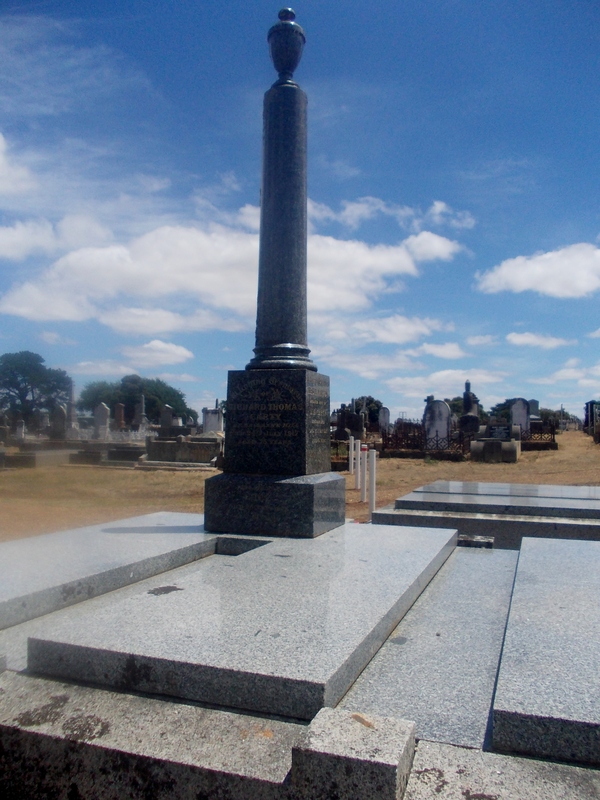 George NORTHCOTT: Died 23 July 1894 at Merino. Born in Devon around 1825, George Northcott, his wife and children, arrived in Portland around 1854. They spent time in Portland before George, a joiner by trade, was engaged by T.H.Clarke to construct some buildings in Merino. He built the Farmers Arms Hotel at Merino around 1855. 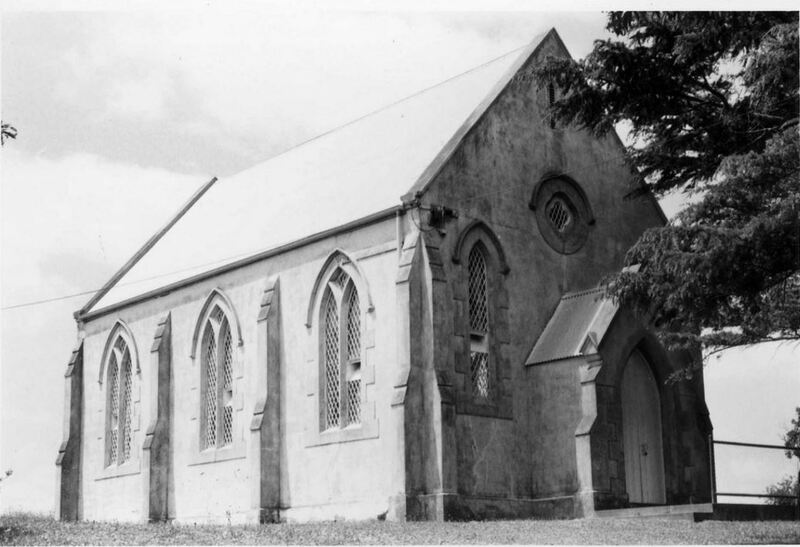 In 1868, George Northcott and my ggg grandfather William Diwell built the Merino Presbyterian Church (below). 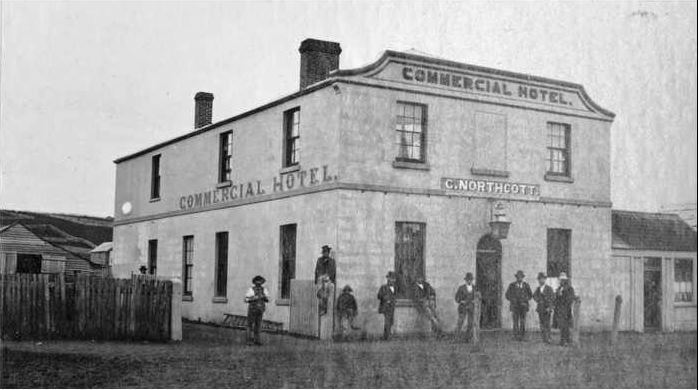 George built the Commercial Hotel at Merino around 1869, the towns third hotel. He leased the hotel out but after the second tenant of the hotel died suddenly in 1877, George took over the running of the hotel and attached Cobb & Co station and become quite wealthy as a result. A few years before his death, George’s wife died and he gave up the running of the Commercial, passing control to his eldest son Henry. George did not get over the death of his wife and by the beginning of 1894, he health began to fail before he died on 23 July. 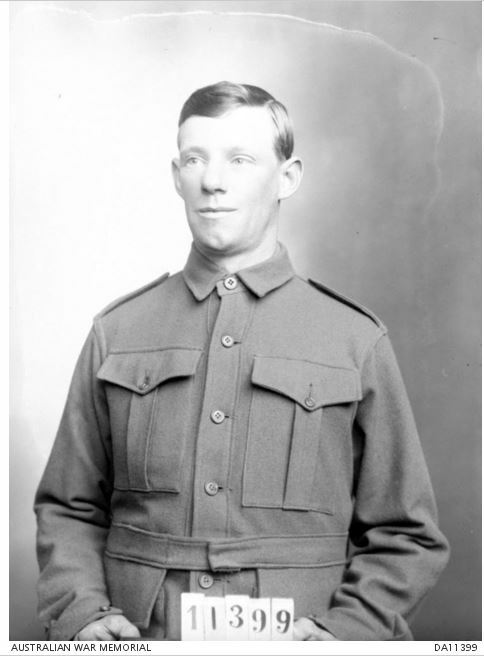 James MALLETT: Died 3 July 1901 at Merino. Born around 1834, at the age of eleven James Mallett arrived in Portland from Tasmania. 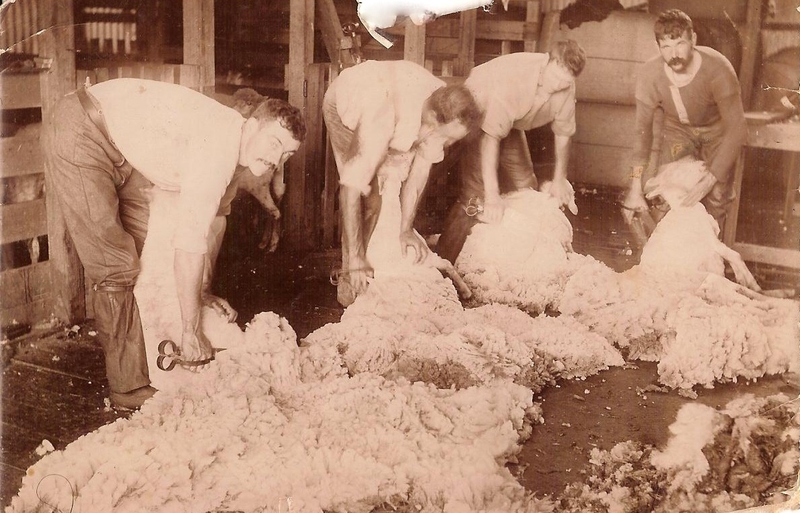 He went straight on to the Henty’s Muntham Station near Merino where he remained for several years before returning to Portland to start a bootmaking apprenticeship. He married and by 1864 had returned to Merino and remained there until his death. He left three sons and four daughters, with a fourth son having died several years before. Stephen NORMAN: Died July 1901 at Hamilton. Stephen Norman was born around 1794. On arrival in Australia, he found himself working for the Henty brothers and was one of their first employees after their arrival to Portland Bay in 1834. Stephen was, according to his obituary, the first man to plough land for the Hentys at Portland. Reaching the age of 107 without a sick day in his life and still with all his faculties, Stephen suddenly fell ill at his home in Casterton and admitted to the Hamilton Hospital where he died a few weeks later. George MAHONEY: Died 13 July 1902 at Dunkeld. Arriving in Victorian in 1841 aboard the Duchess of Northumberland, George Mahoney began his time in Victoria as manager of Glenmore Estate near Bacchus Marsh. He was there several years before moving to Geelong for a short time before settling at Dunkeld. A farmer, George led a quiet life away from public affairs although he did keep up an interest in politics and current affairs. George was eighty-two at the time of his death and left a widow and nine children. Richard William COLLINS: Died 13 July 1902 at Hamilton. Richard Collins was born in Brixton, London around 1840 and arrived in Victoria in 1857. He settled at Hamilton, working as a carpenter. He later worked at Mr Allen’s timber yard until setting up his own yard, the “Victoria Timber Yard” in 1879. After selling the timber yard, Richard and his wife returned to England for a visit and on their return purchased a farm at Mountajup. After only a few years, Richard returned to nearby Hamilton setting up a timber yard on the corner of French and Cox Streets and he operated it until his death in 1902. A member of the Church of England, Richard left a widow but their marriage was childless. The Hamilton Brass Band played the “Death March” at Richard’s funeral at the Hamilton Cemetery. 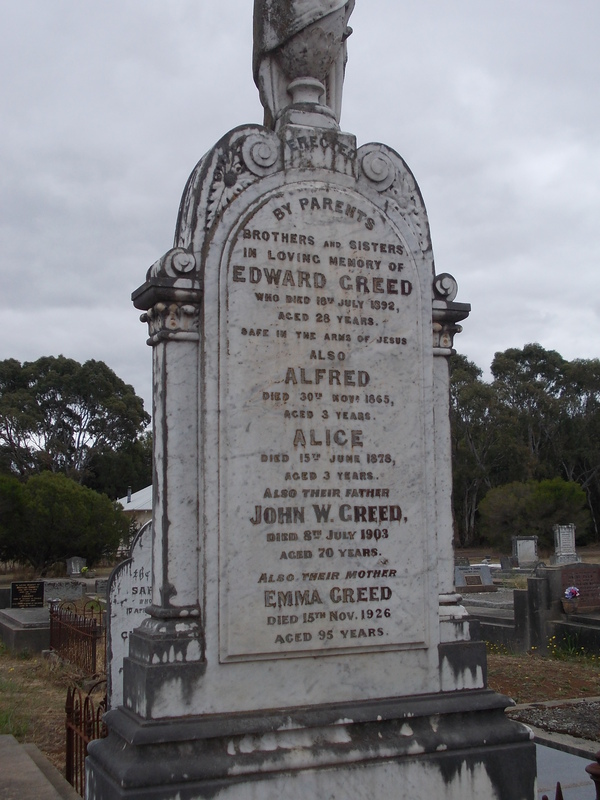 John Weaver GREED: Died 8 July 1903 at Hamilton. Born in Taunton, Somerset, England in 1834, John Greed married Emma Grinter in 1856. They continued to live in Taunton with John working as a mason and two daughters were born. In 1857, John’s parent Charles and Sarah Greed and his younger siblings left England for Victoria aboard the Balnaguith. In 1862, John and Emma and their daughters left England aboard the Lighting for Victoria and on arrival in June 1862 the family headed straight for Hamilton to join John’s parents who had settled there, with Charles Greed running a glazier’s business from Lonsdale Street. Hamilton was still in its infancy and John was the first to build on the town’s northern hill, land “dotted” with the mia mias of local aboriginals. John began a carpentry and contracting business and an early job was to build the fence for the then new shire offices as reported in the Hamilton Spectator and Grand District Advertiser on 20 May 1864. Earlier in the month, the same paper published a business directory and by that time there were two undertakers in the town, George Brownless and John Lobban. From searches of the Spectator from that year, it also seems it was the year when John took up a contract with the Hamilton Hospital and Benevolent Asylum to conduct funerals for them. 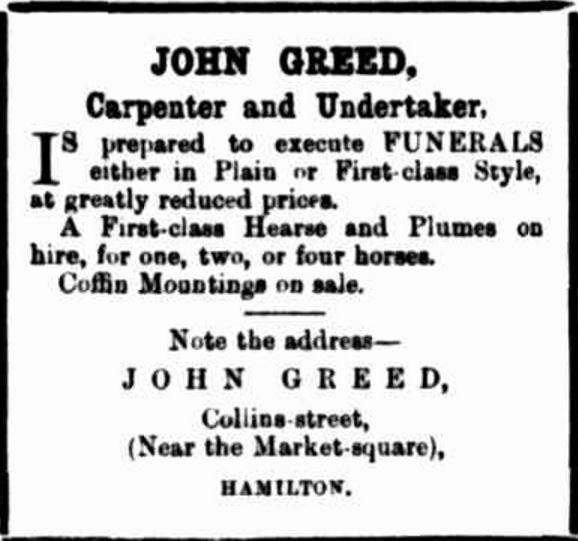 But it was not until April 1871 before I found the following advertisement for John as both a carpenter and undertaker. “Advertising” Hamilton Spectator (Vic. : 1870 – 1873; 1914 – 1918) 5 April 1871 <http://nla.gov.au/nla.news-article196303937&gt;. Interestingly, from around 1880, John Greed’s advertisements included the words “Established in 1861”, however, both the 1861 England Census and the Victorian Shipping Records prove John was still in England. “Advertising” Hamilton Spectator (Vic. : 1870 – 1873; 1914 – 1918) 17 April 1880:<http://nla.gov.au/nla.news-article225490515&gt;. Hamilton Spectator (Vic. : 1870 – 1918) 17 April 1888: 2 (SUPPLEMENT TO THE HAMILTON SPECTATOR). <http://nla.gov.au/nla.news-page22226411&gt;. The undertaking business tied in well with John’s brother Abraham’s coachbuilding business and one of John’s sons Walter eventually worked for Abraham, a Mayor of Hamilton. John was a Methodist but converted to the Baptist Church, located close to his home in Collins Street. He was also a member of the Forester’s Lodge and the Oddfellows. With the latter, he was twice a member of the board of directors. He was also made a Life Governor of the Hamilton Hospital. Around 1887, John suffered a paralytic seizure reducing his activities and in time leaving him an invalid. That saw John’s youngest son Frank take over as manager of the business around 1892 when he was twenty. On 23 June 1903, John Greed was in his room at home with his wife Emma. She left the room, leaving John standing in front of a fireplace containing a colonial oven. John fell backwards into the fireplace falling beside the oven but landing on hot iron bars in the fireplace. He called out to Emma who rushed in to find him in the precarious position. She managed to get him out and into his bed. The doctor was called and he treated burns to John’s back, legs and hands but the shock of the fall saw him fall into a coma like state. Two weeks after his fall, John Weaver Greed died. On 12 September 1903, the Hamilton Spectator announced Frank was taking over the business. F.Greed & Sons was born and still operates under that name today with the Greed family still at the helm. 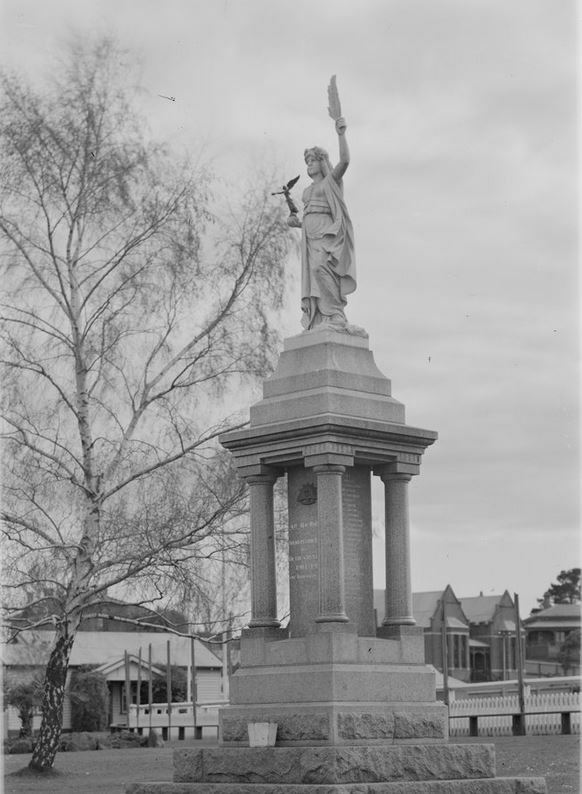 Euphemia McDONALD: Died 13 July 1907 at Condah. Euphemia McDonald was born around 1832 at Mull, Argyllshire, Scotland. She arrived in Victoria in 1852, disembarking at Portland. It’s unclear when Euphemia married Alexander Urquhart, but they did have a son Thomas born in 1858. 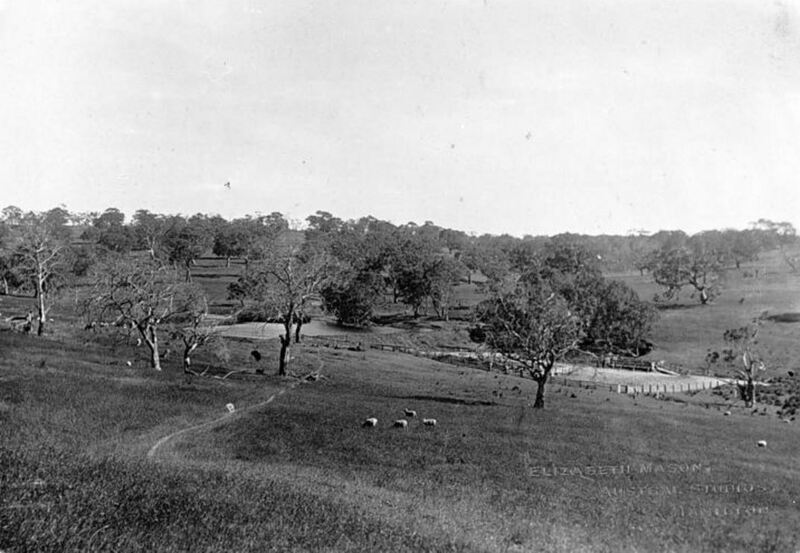 In the late 1880s, Alexander took on the management of Samuel Winter Cooke’s property Condah Hills. In 1901, disastrous bushfires swept through a large area south of Hamilton, including Condah. Euphemia received severe burns to her hands and feet and was only saved by her son John’s actions of lowering her into a well. She never fully regained her health and Euphemia died at the age of seventy-five. Samuel VANCE: Died July 1908 at Bridgewater. Samuel Vance arrived at Portland in 1855 from Northern Ireland aboard the Cairngorm. 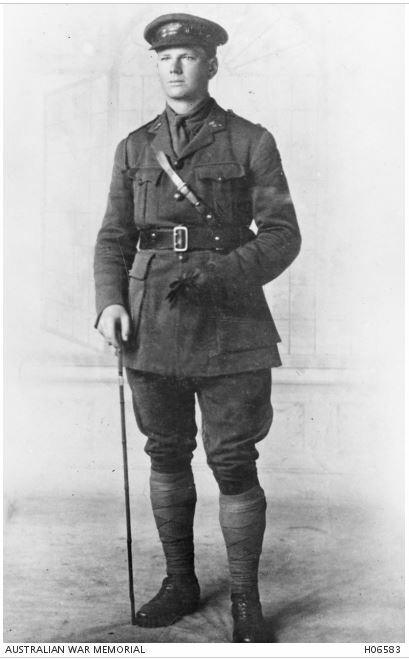 Prior to his departure, he had served in the British Army. Samuel worked as a farmer and a contractor for the Portland Shire Council. During the 1880s, he built the Sea View Hotel at Bridgewater and ran it until the time of his death. Sarah CAMERON: Died 8 July 1908 at Geelong. Sarah Cameron was born in Scotland in 1819 and married Archibald MacDonald and they had three daughters. Archibald fate is not mentioned but Sarah went on to marry Donald Cameron of Southland, New Zealand who himself had five daughters and two sons. From NSW they travelled overland to the Colony of Victoria, settling first at Campbellfield near Melbourne before moving on to Morgiana near Hamilton, then called the Grange. Donald’s uncle had taken up the run only a few years earlier and Donald took over the running of the property. The Camerons of Morgiana were well known in the Hamilton district Sarah’s is an interesting obituary as it lists early settlers in the Hamilton district. Anne BELL: Died 4 July 1909 at Hamilton. Anne Bell was born in Ireland and travelled with her parents John Bell and Elizabeth Morrow to Victoria in 1841, arriving at Portland. With them were Anne’s seven siblings. The family travelled from Portland to Mt Eckersley near Heywood where they settled. In 1848, Anne married Henry Barr and with the discovery of gold, the couple left for the diggings remaining two years with little success. After their return to Heywood, Henry bought the Heywood Hotel and together Ann and Henry ran a successful business. On 19 February 1865, the stables adjoining the Barr’s hotel caught fire. As a result of his exertion, Henry fell ill and never recovered, dying in July 1866. Anne and her family moved to Lake Condah were they remained for the next fourteen years. After the sudden death of her son, Anne returned to Heywood but eventually sold her interests there and went to live with her children, first John at Lyons between Heywood and Dartmoor and then George at Strathkellar near Hamilton. 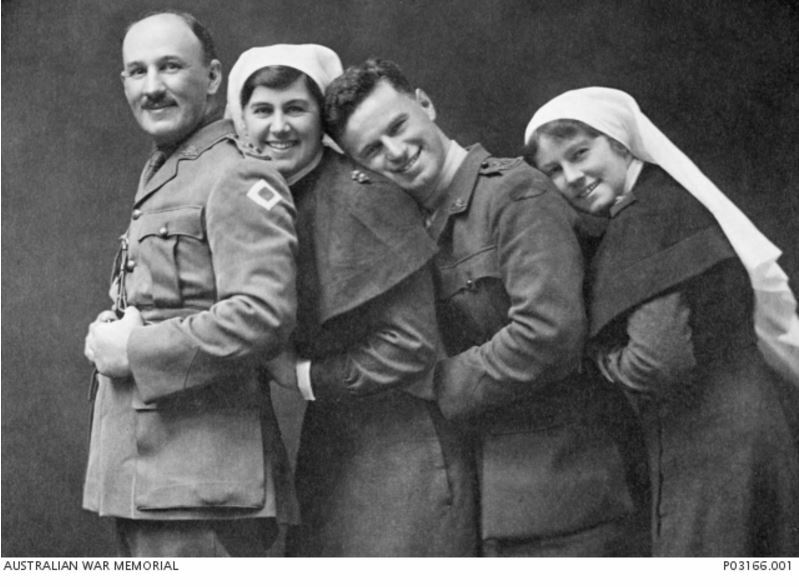 Anne fell ill in June 1909 and was admitted to the Hamilton Hospital where she died on 4 July. 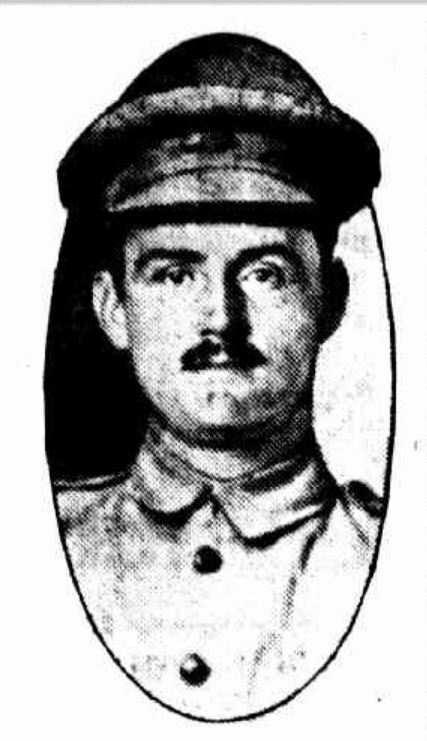 John PERRY: Died 8 July 1913 at Coleraine. Born in Bristol, England in 1818, John Perry looked set for a career as an artist but decided to choose an outdoor pursuit working in agriculture. He married Elizabeth Holbrook at Bath, England on 3 December 1839 and thirteen years later, the Perrys with four sons left England for Australia. Sailing on the Priam, the Perrys arrived at Portland in 1852. John’s stock experience in England held him in good stead for employment and his services were desperately sort after by Edward Henty at Muntham Station. However, staying loyal to a commitment he made to Mr A. Munro, John went to work for Munro, managing several stations including Dundas and Bassett. By 1859, John had entered into a partnership and purchased land near Ararat. However, the death of one of his sons at the property saw him sell and return to Branxholme and later Merino Downs working for Francis Henty. Over the next twenty years, John managed various large properties throughout the district. He eventually retired to Digby and in 1886, Elizabeth died. John continued painting as a hobby throughout his life. 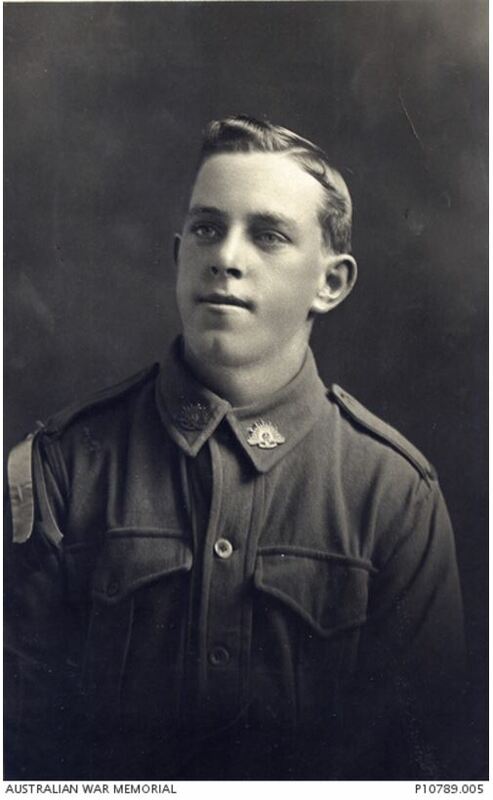 William DUNN: Died 12 July 1914 at Box Hill. Born at Taunton, Somerset, England around 1833, William Dunn arrived in Victoria in 1855 aboard the Raven’s Craig. He spent time in Geelong before riding on horseback to Hamilton where he remained for the next forty-four years. William was a builder and in 1866 entered into a partnership with another builder William Holden and together they set about “building” Hamilton. Holden and Dunn built some of Hamilton’s grandest buildings, most still standing today. They included the Bank of Australasia, the Bank of Victoria and the Colonial Bank and the residences of doctors including Hewlett House and Roxburgh House. They also built the first brick house in Gray Street owned by Mr S. Radley, the Hamilton goal and many shops in the CBD of Hamilton including a strip of shops running from the corner of Gray and Thompson streets. Looking at the histories of some of the buildings Holden and Dunn constructed, it seems William Dunn has become the forgotten man of the partnership, with Holden given credit alone. However, newspaper articles from the time and William Holden’s obituary confirm their partnership. In his personal life, William married twice and left a widow and four children at the time of his death. You can see more about Holden and Dunn and their work in the slideshow below. 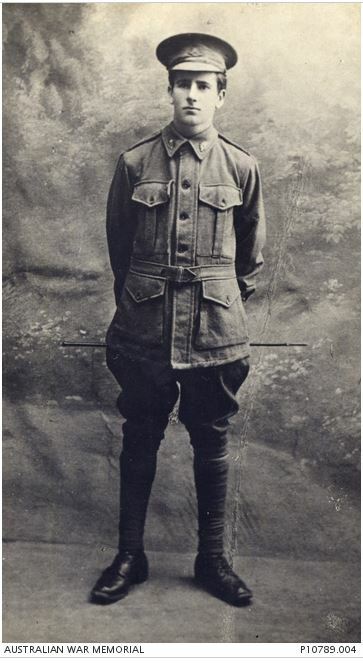 Richard Thomas CARTY: Died 24 July 1917 at Hamilton. Richard Carty was born in Wexford, London in 1842 and at age seventeen arrived in Australia. With little to his name, he tried various jobs before going to the New Zealand gold diggings. After mixed fortunes on the diggings, Richard returned to Australia and took up cattle droving. He became manager of the Bredelbane Estate near Castlemaine and with that experience, leased Mt Clay Estate near Heywood during the 1860s. Success from that venture enabled him to lease Bark Hill Estate in 1873. In was also in that year, Richard married Lucy Hawkins. In the early 1880s, Wando Vale was subdivided for Closer Settlement and Richard and Lucy moved there, remaining for three years. On 1 January 1885, Richard took possession of Brisbane Hill at Byaduk. Richard and Lucy remained at Brisbane Hill until around 1916 when they moved into Hamilton, residing at Montacue in Kennedy Street until Richard’s death. 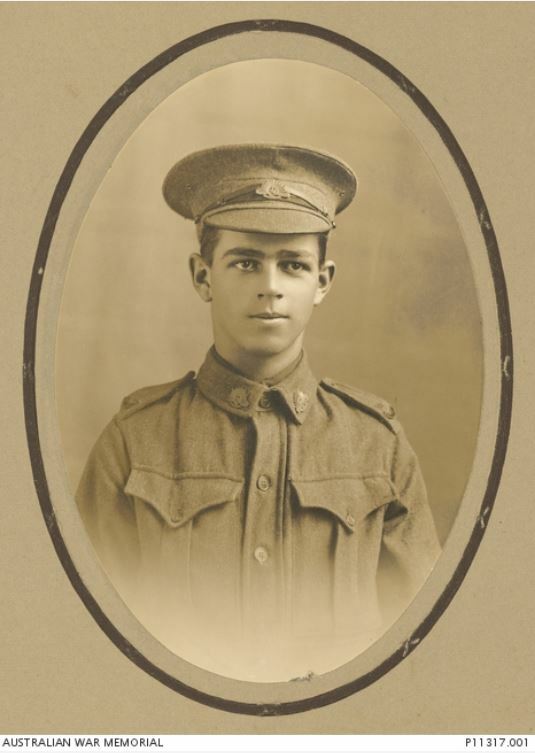 James LODGE: Died 31 July 1918 at Casterton. A son of James Clapham Lodge and Hannah Hudson, James Lodge was born at Richmond, Victoria around 1859. He became an apprentice stonemason and stone cutter and following his apprenticeship, moved to Stawell working in stonemason partnership Lodge and Timmins. In 1884, James married Ellen Murphy and they had six sons and two daughters. 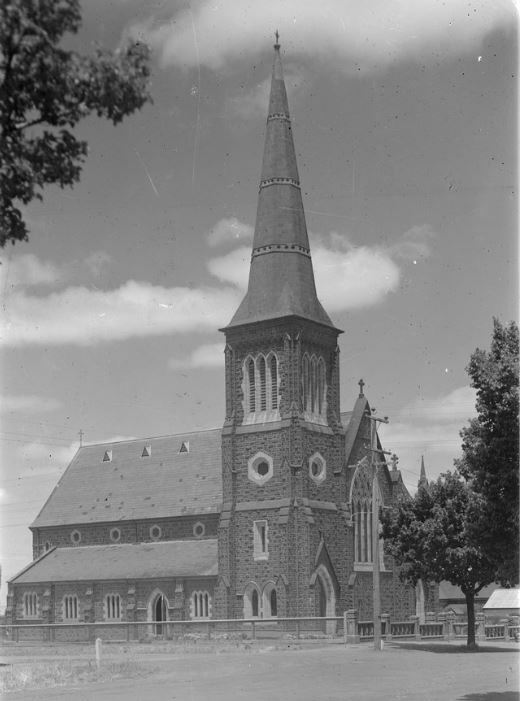 Around 1892, James moved to Hamilton, taking up residence in Clarke Street and one of his first jobs was as clerk of works on extensions of Hamilton’s Catholic church St Mary’s. Later he would add a spire to the church. 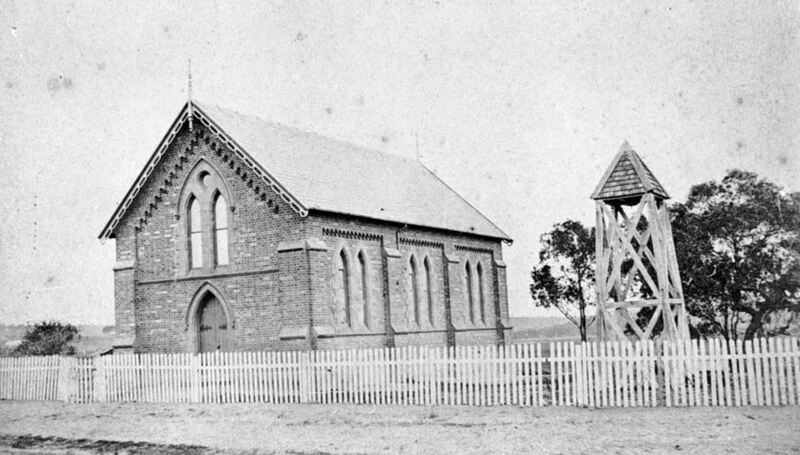 Churches were James’ speciality, building extensions to Catholic churches in Penshurst, Casterton and Koroit. He also built the Tabor Lutheran Church and Tarrington school building. James’ sons followed him into the business, however, in 1906, eldest son Harry fell ill and died of inflammation of the kidneys on 17 June. The years of WW1 were difficult for James. With five sons, James saw his oldest four boys Gus, Frank, James and Richard enlist. 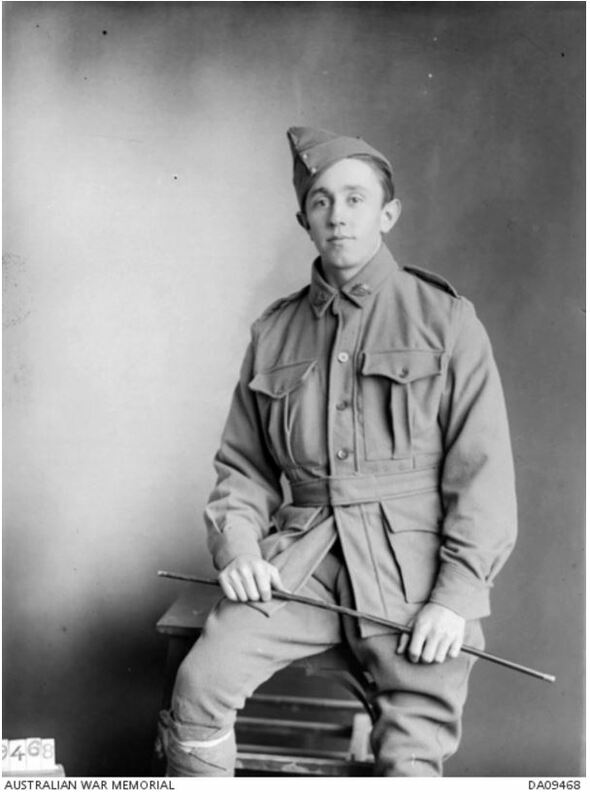 During those years, James won a street channelling contract with the Borough of Hamilton and during June 1918, James and his youngest son Frederick were building the Catholic presbytery at Casterton. 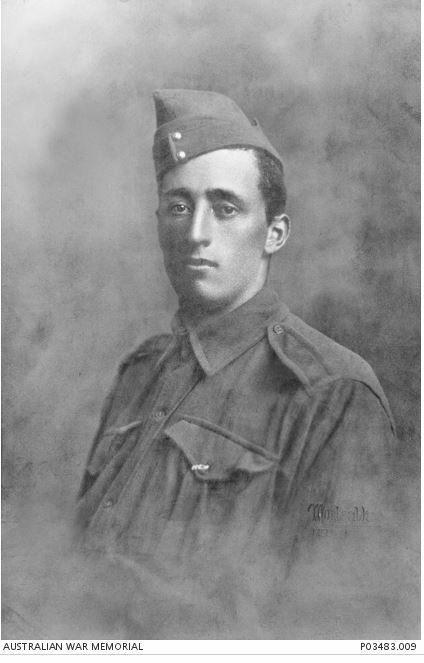 Frederick was eighteen and keen to join his brothers overseas. 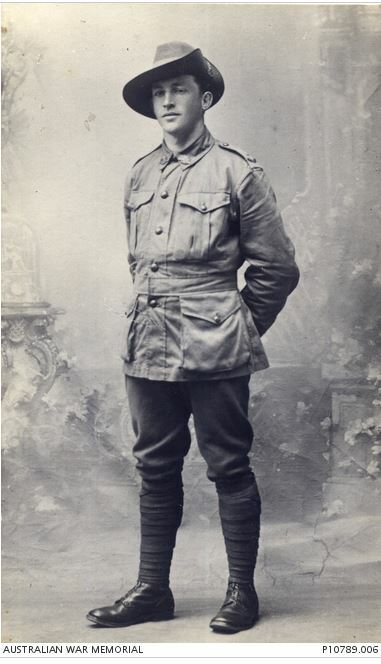 However, Frederick caught a cold while working on the presbytery and it developed into double pneumonia and he died on 20 June 1918, While James was worried about his four sons overseas, it was the son under his own watchful eye who would die. Despite his grief, James continued working on the presbytery but around July 21, he too fell ill with a cold. 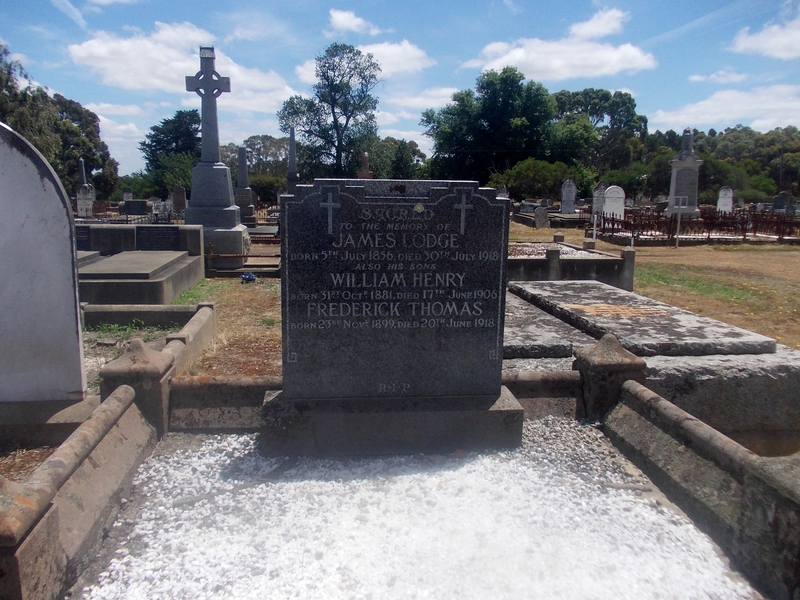 Within days, James was diagnosed with pneumonia and pleurisy and he died during the afternoon of Wednesday 31 July and buried at the Hamilton Old Cemetery. 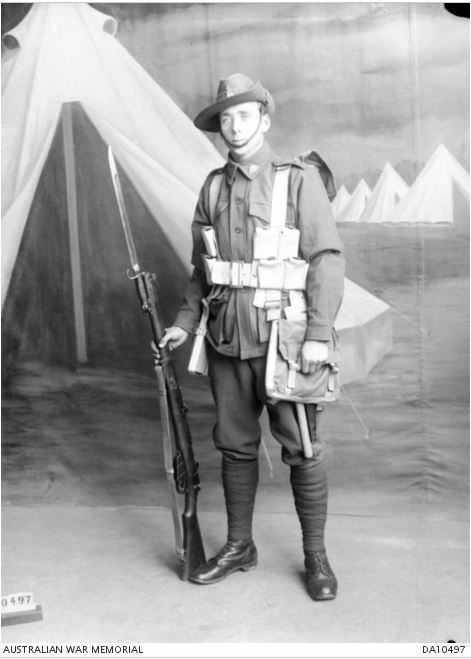 Just weeks after James’ death, on 24 August 1918, trees for Hamilton’s Clarke Street Memorial Avenue were planted, with the first tree planted in front of the Lodge home in memory of James followed by another four for each of his enlisted sons. The Lodge boys all arrived home safely from war having served with distinction. 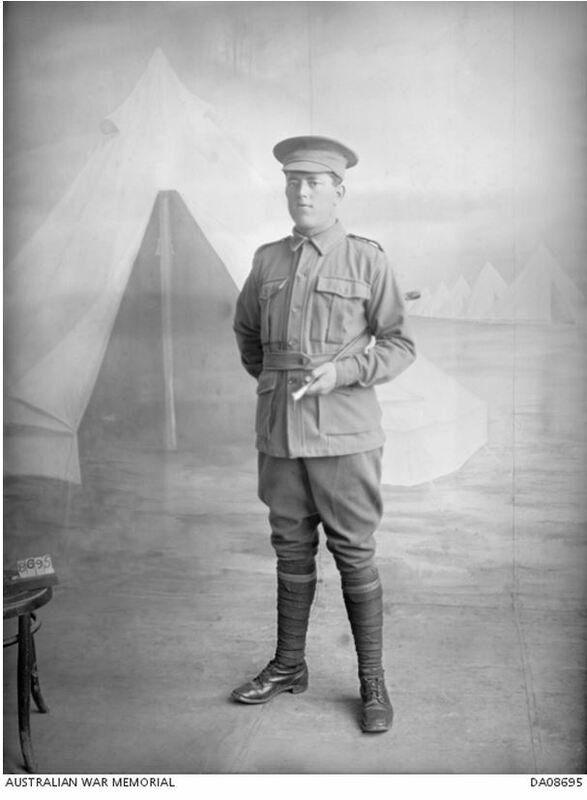 Gus was awarded a Distinguished Service Order for conspicuous bravery at Pozieres. 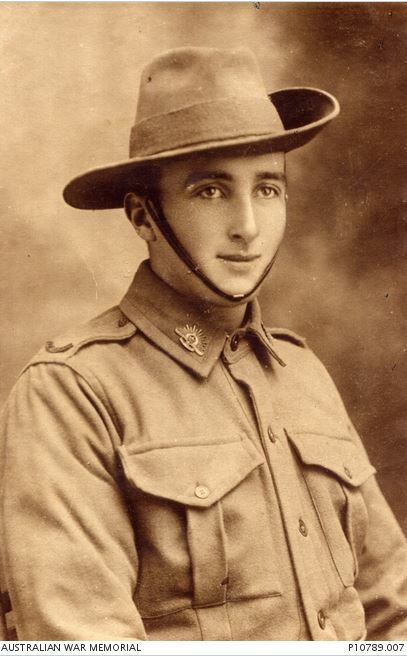 Frank was awarded a Military Medal for his efforts at Pozieres and later a Military Cross for his service at Mont St. Quentin in 1918. 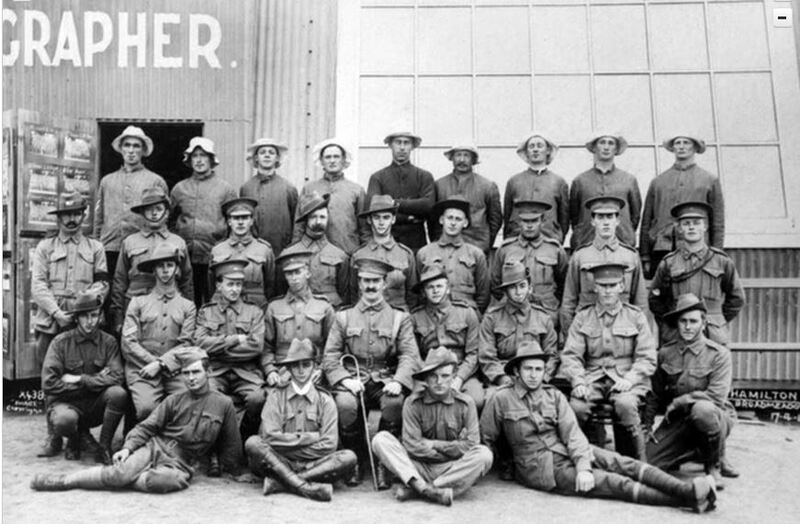 Settling into civilian life, the boys returned to stone masonry operating as Lodge Bros. and in 1928 were awarded the contract to build Melbourne’s Shrine of Remembrance, employing returned serviceman as labourers. The business still operates today.